Award winning lacquer artist Valentin Tikhomirov's mastery of lacquer art is apparent in this striking work. The traditional composition calls to mind an icon, with the tale beginning at the upper left. Ivan, mounted backwards on a wild horse, hangs on for dear life as it tramples his father's fields. He eventually lets go when the horse promises to send him two fine horses to sell, and a humpbacked pony who will be his friend. The foreground has Ivan boldly dickering over the horses with the tsar himself! 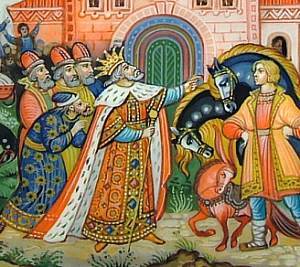 His greedy brothers yell for Ivan to accept the Tsar's first offer, but the Pony tells him to stand firm. 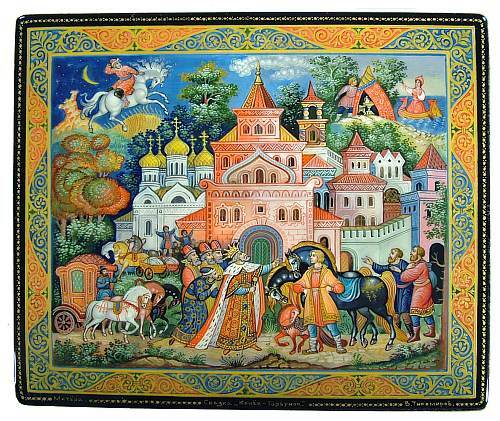 The upper right has Ivan hiding behind a silken tent, waiting to glimpse the beautiful princess. (To read the whole fairy tale, click here.) The scene is breathtakingly painted, with the soft, creamy colors ripening into deep jewel like tones, to add drama. Tikhomirov has used his signature border of thick golden swirls against a red and blue ground to frame the scene, creating a sense of rhythm. The sides are decorated with a lacy variant of the design, peppered with tiny blue and red blossoms. 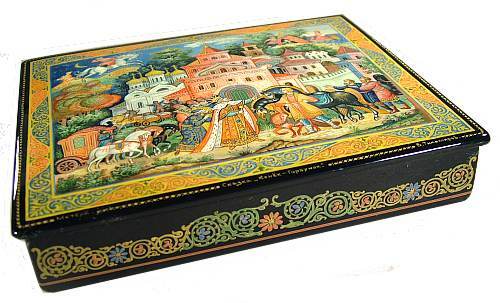 This box is made of high quality papier mache and is signed on the lid with the title, artist's name, and village. There is a hinge at the top, and the interior is red lacquer. The base of this piece is flush. There is small scratch or crack in the lacquer on top which is virtually impossible to notice, and has not gotten any worse in the more than 9 months that we have held on to this piece. It seems truly very minor, but we reduced the price of the box by $150 to compensate for it. (Originally it was $1095 internet price). An exquisite colorful piece from one of Mstera's best artist!